This photo was taken on June 30, 2016 at 10:40 AM. 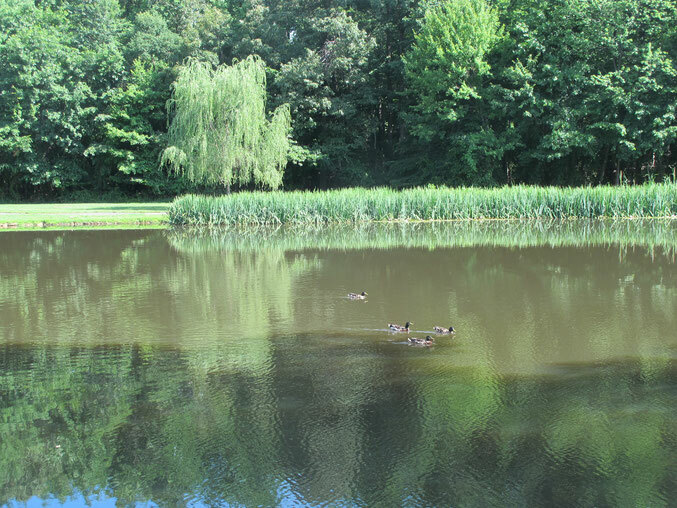 The location is at a man made lake at Fairview, Virginia. The "Take It!" My "go to" location is this little body of water that I refer to as "The Pond Beyond" for although it may be man made, it is magical in its composition and the effect it has upon those who visit it. This effect goes for all the living things that are found there. My intention was to capture the reflection of the opposite side of the pond where there is a bench situated near a small willow tree. When I arrived, there was a person sitting on the bench. No offence to the human, but I wanted to have the photo dedicated to nature. In just a few moments, this group of Mallard Ducks, happened to be doing one of their routines, and provided me with a perfect complement to all of the plants and water which are the constant in this setting. The After Take: Has had me showing a few of my review group the shot, and all giving it their approval to be used for this great season of Summer, as the banner to commemorate it. Here is hoping you have a "go to" location that is convenient to you which you can visit and immerse for a while in the setting as a refresher. Should you not have one, I humbly submit this photo as well as others on this site, to provide a start for your imagination to transport you. I remember seeing many photos from this Pond Beyond you call it. Such a beautiful spot, I am truly envious you get to see this as often as you seem to. What a gorgeous day! Great picture too! Toss me a beer and a fishing pole and I'll make a good day sitting on the side of that pond.... Wouldn't even really care if it had fish in it lol.